The Discmania C-Line PD Freak is an overstable distance driver, power driver which is very resistant to the wind. The PD has good glide and is useful for sidearms, stable powershots, and long flex shots for experienced players. This disc golf driver offers longer and straighter shots with a reliable low speed fade. It is a great choice for long drives, controlled drives, flicks, and advanced and pro players. "...It gets great distance without having to use a super wide rim, easy to power down, and more importantly easy to control...."
"I found one of these in the ditch the other day. I had never thrown a discmania disc before. I gave it a huck and was pleasantly surprised. 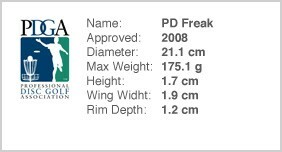 I mainly throw Innova discs and was noticed the freak throws similarly to the innova star orc. The freak was slightly less stable than the orc in all the right ways. This disc went a lot further than I thought it would, a lot. If you like throwing an Innova Orc, get this disc and add 20 feet to your shot."